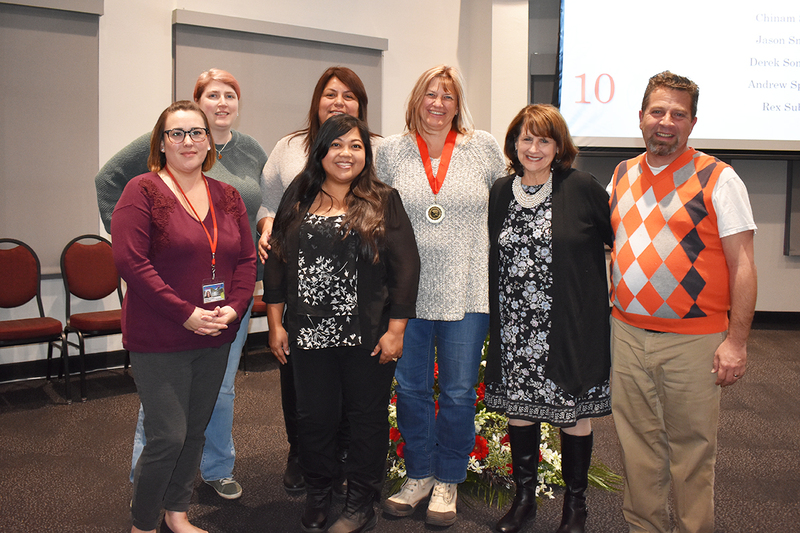 UNLV Executive Vice President and Provost Diane Chase recognized UNLV Performing Arts Center Executive Director Lori Pullen for thirty years of service to the university at the Faculty Length of Service Recognition Program on Wednesday, December 5. After moving to Las Vegas with her parents from New Mexico, Pullen attended Bonanza High School and began work as an usher at the UNLV Performing Arts Center in her senior year. She also worked in the box office before becoming box office manager and then business manager. After serving as the business manager for many years, then-Dean of the College of Fine Arts Jeff Koep promoted her to her role as Director of Finance & Guest Relations. She directed operations at the Performing Arts Center with a co-director until February 2017, when Dean of the College of Fine Arts Nancy J. Uscher appointed her as Executive Director. Provost Chase included Lori's story as she honored those who served for thirty years. Dean of the College of Fine Arts Nancy Uscher, Business Manager Delia Martin, and Performing Arts Center staff, including Denise Flores (Administrative Assistant), Lynn Ware (Technical Director), Joy Montano (Guest Relations Manager), Shaun Franklin-Sewell (Director, Marketing & Patron Services), and Shahab Zargari (Communications Coordinator) attended the celebration to help honor Pullen's service.